XIAMEN, China, April 4, 2019 /PRNewswire/ -- Yealink embarks on a global roadshow in 7 countries, showcasing the state-of-the-art New T5 Business Phone Series. The T5 Business Phone Series offers a breakthrough IP desktop phone portfolio, making smart desktop collaboration for enterprise offices, easier than ever before. The huge success of Yealink's T2 and T4 series resulted in Yealink ranking No. 1 in the global SIP phone shipments market. 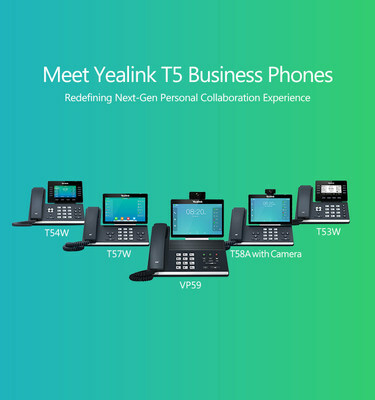 Considering the rapidly changing trends in the business communications industry, and to address the growing collaboration needs of its customers, Yealink introduced the T5 Business Phone Series. During the global roadshow, Yealink will present the T5 Business Phone Series in the following countries: USA, Germany, Australia, Canada, England, France, and the Netherlands. According to Leo Huang, Yealink's VP of Sales, the T5 Business Phone Series offers a future-proof solution with the latest features of Yealink's cutting-edge technology. With its enriched features, the T5 Business Phone Series is instantly recognizable as a sharp new version of the Yealink's popular SIP phone series. Yealink's Acoustic Shield Technology enables the T5 Business Phone Series to deliver distraction-free voice clarity by suppressing the background noise. It is ideal for busy workspaces, especially for an open office environment. This massively increases the productivity of remote meetings. Equipped with all-inclusive features, large color touchscreen and intuitive hard keys layout, the T5 Business Phone Series allows quick discussions and fast decision making. All in all, this means more versatility for an enterprise environment. Having an adjustable HD camera, the T5 Business Phone Series provides business-quality, affordable HD video conferencing solutions to busy professionals. The smart video phone VP59 has a 1080p full HD camera while the smart business phone T58A supports 720p HD video with an optional Yealink USB camera CAM50. The T5 Business Phone Series supportsseamless call switch over between desktop phone and the cordless DECT handset. This provides limitless flexibility and scalability. Built-in 2.4G/5G Wi-Fi, frees busy professionals from restricting to an inconvenient location. While the built-in Bluetooth 4.2 for mobile phone connection and wireless headset helps to save battery life. These improved features dramatically increase connectivity options at the workplace. Yealink's Product Director Lee says, "Yealink's global roadshow aims to provide a unique platform to businesses. It is an opportunity to understand how the T5 Business Phone Series can serve as a powerful communications solution to enhance key business relationships."